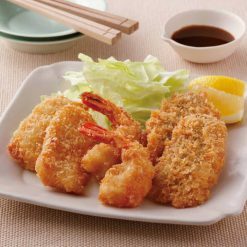 A set of 2 pieces each of 3 types of fried seafood, all of which have been seasoned and then breaded. This mix is nicely varied and easy to make. 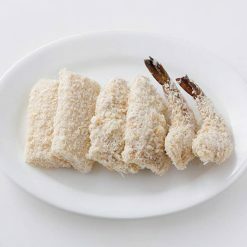 Product totals 110g (2 fried shrimp, 2 pieces of fried squid, and 2 fried Japanese horse mackerel fillets). The mackerel in this item is fresh Japanese horse mackerel caught in Sakaiminato in Tottori Prefecture. The shrimp in this item are black tiger shrimp from Indonesia. The squid in this item is purple squid, which has a moderate texture. Sugarlady’s seafood is caught in season and processed right away, ensuring that you always receive the highest possible freshness and flavor. Because this seafood mix comes breaded and ready to fry, the amount of time you need to set aside for prep and cleanup is drastically reduced. In addition, because it comes frozen, it is easy to have plenty on hand at any time without worrying about it spoiling. Sugarlady’s seafood and other frozen products allow you to cook meals from all sorts of real, nutritious ingredients whenever you desire, even on the busiest of days! Without defrosting the seafood, fry it for about 4 minutes in an ample quantity of oil that has been heated to about 170℃.Notes: Do not fry a large number of pieces at the same time. If there is frost on the breading it can cause the hot oil to jump, so please be sure to remove any outer frost before frying.The cooking time listed is an approximation. Please adjust according to the quantity of oil used and the efficiency of the cookware. This product contains Fried shrimp] shrimp (Indonesia/aquaculture black tiger), coating (panko, wheat flour, sugar, dried bonito stock, table salt, yeast extract) [fried squid] neon flying squid (purple squid/China), coating (panko, wheat flour, sugar, table salt) [fried Japanese horse mackerel fillets] Japanese horse mackerel (domestic), soy sauce, sugar, refined sake, coating (panko, wheat flour, sugar, table salt).. Origin of ingredients: shrimp (Indonesia), Japanese horse mackerel (domestic), neon flying squid (China). Prepared and packaged in Japan.